Is there a fix for this? What parts do i need to replace? Apologies for using the wrong terminology- I'm new to this! thank you for your post and welcome to our community! First off, I took the liberty to change your username by removing your email handle for privacy reasons. Hope you don't mind. Could you share a photo of the backside of your print head? Is there any visible damage? It is possible that during cleaning a wire got damaged which is causing this error message. The PT100 which reads the temperature is not as strong as a cable as the heater cartridge. Thanks for the reply and the edits to my details. I've added some pick, there was a lot of plastic to be removed so it is possible the PT100 was damaged. They don't look very damaged to me (Does not mean they are not damaged but would have been easier to detect). On photo 2, did you already start taking it apart or is that how far the cartridge heater and PT100 are inserted? If so, they should be inserted much further. 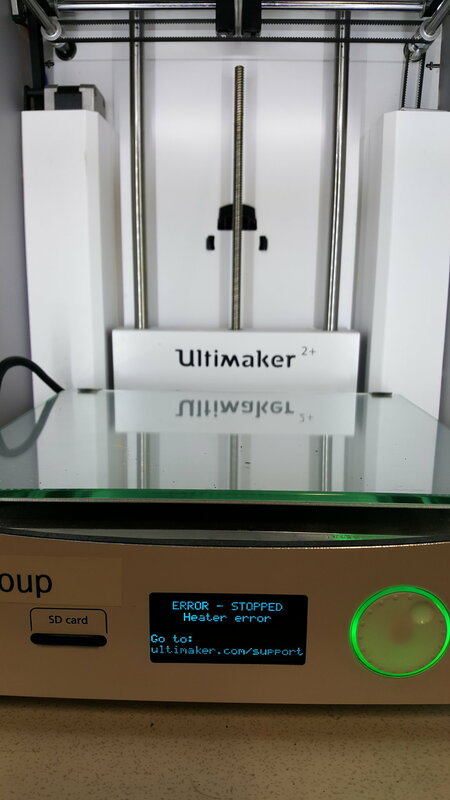 Do they read room temperature correctly, when you just turn on your Ultimaker but don't heat it up? What does your PT100 read when you heat it up with a blowdryer for example? They insert fully- i had loosened the screw. I read somewhere on here about doing a factory reset- since I've done this I can't see a temp reading to test it as the error occurs during set-up at the material insertion phase. Was it these tips that you followed? 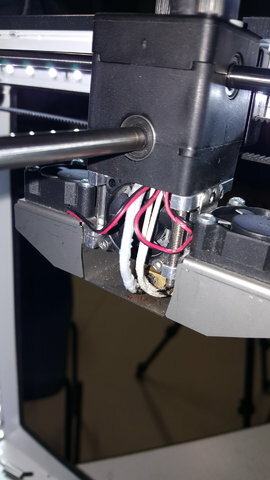 HEATER ERROR means it had the heater at full power for 30 seconds and the nozzle didn't increase by 5C. If it is reading at 20C when this happens then the heater is broken. 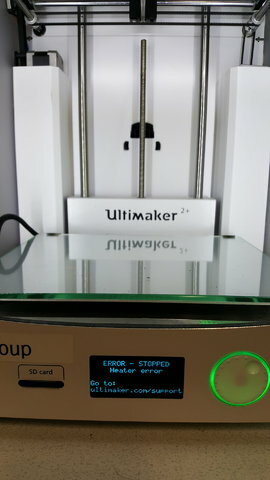 If it reads around 90C when this happens (not 5 minutes later but right when it happens) then it's more likely the sensor that needs replacing. If it happens when the fans come on and at temps > 200C it usually means the fans are blowing on the block or the block is touching the aluminum shroud. Usually, if it's the sensor you will also see the temp jumping around a lot or climbing much faster than one possible (100C in 2 seconds). 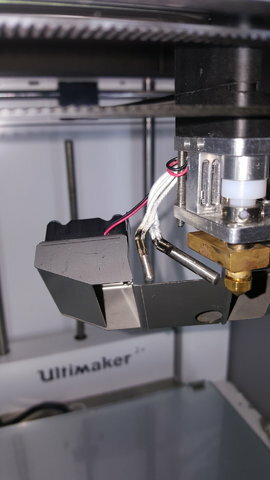 Often the temp sensor works fine at room temp but when you heat it up something expands and a contact starts to open up. Thanks guys, I'm very impressed with the speedy response on here! I'll check both of these today. @SandervG I haven't followed these tips- i followed the Heater Error tips. I'll post an update later. Hi @gordon-obrien, we're happy to help! Halfway down the page you can find the heater error tips, I was wondering if it was those that you followed. 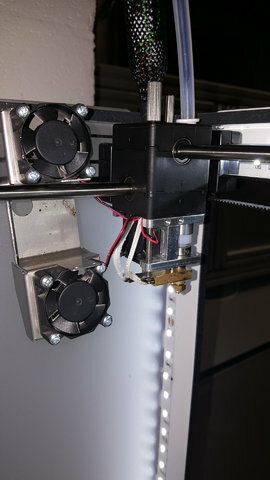 For example, if your nozzle is touching the fan bracket and heat is flowing away through it. Little tip; if you want to mention a person you have to click the name in the dropdown menu. That is how you make the connection to the database, and that is the difference between a mention and writing something with '@...'. Looking forward re your updates! I went through all these checks again and I'm going to order a new heater based on the below from @gr5 the heater was failing around 90° when i had control over it but now that it's in set up mode it's failing at a low temperature. The PT100 is measuring 110 Ohms at room temperature so that seems to be fine. Hi @SandervG & @gr5 I changed the heater cartridge and the printer is working perfect again!